A stylish addition to a home in Coburg. After the floor level was raised, a new Baltic pine floor and stacker timber sliding doors were added to create a new dining room. I'm delighted with the job that SPV homes have done for me. They produce finely finished work and are very professional while also being very friendly, trustworthy, and accommodating. I was impressed by their commitment to do the best job while also looking out for good deals on materials etc for clients. I wouldn't hesitate to recommend them to friends and will certainly call on their help for future jobs. Victor and Phillip, we are extremely pleased and proud with the quality of workmanship and finish of our new townhouses. Thank you for your time and experience you shared with us, it was greatly appreciated. We were impressed by the integrity, professionalism, knowledge and attention to detail during the whole construction process from beginning to end. It sure was great to find builders who started and finished the project within budget and well before time which was a bonus and showed individual personal attention which developed into a great partnership. 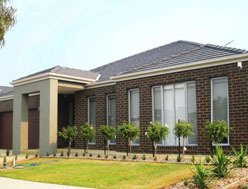 We have no hesitation in recommending SPV Homes to anyone who may be considering building in the future.